NO DE-CAF HERE When the Trashmanian Devil went to the deli for his morning cup of coffee, he thought of sending his empty cup –washed, no styrofoam–to Gwyneth Leech. She’s the featured artist who is busy creating installations in the “prow” window of the Flatiron Building in Manhattan–and she’ll be working in full view of the passing public until December 31. Gwyneth draws fractal patterns on her morning coffee cup and on those contributed by her friends. Then she adds them to her ever-growing mobile. Her obsessive drawing is called Hypergraphia in some circles–but it’s Art with a capital A to the Trashman. Best of all, those cups aren’t litter. The Flatiron residency is sponsored by Cheryl McGinnis Projects. You can find more of Leech’s works there. Walked by this exhibit on thursday. 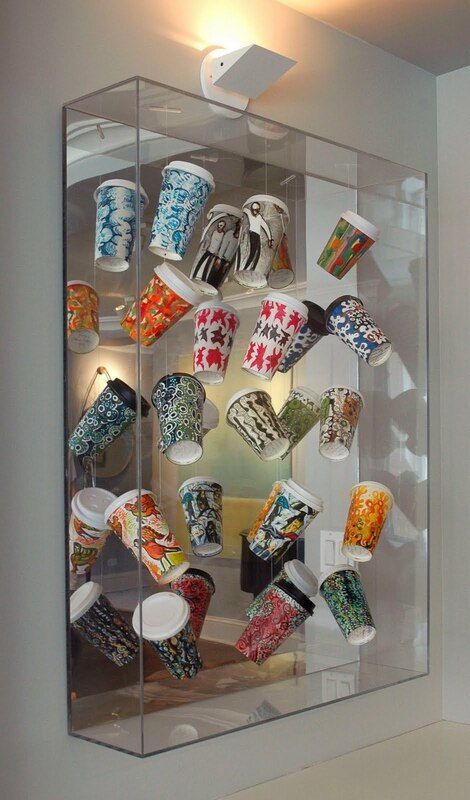 A women was in the window amongst all these art coffee cups taking photos. I really liked all of this as I was walking by. This is so cool! 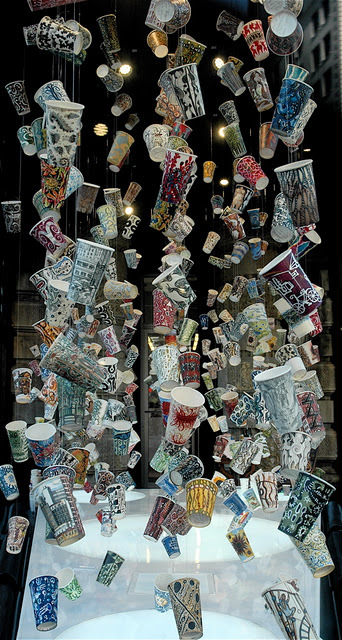 Gwyneth Leech is a really great artist-and she recycles while creating something beautiful at the same time!!! I really like the furthest one to the left (on the second row to the bottom); it is very cheerful and bright. Please keep posting such great art!